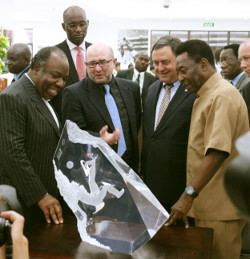 Gabon President Ali Bongo (left) presents a multi-dimensional acrylic sculpture honoring legendary soccer player Pelé (right) at the dedication Feb. 9 of the country’s new Friendship Stadium in Libreville, Gabon. It is hosting the 2012 Africa Cup of Nations. Pictured from left to right are: President Bongo, 2004 Academy Sport Artist of the Year Sergey Eylanbekov, United States Sports Academy Vice President Dr. T.J. Rosandich, and Pelé. The Republic of Gabon and the United States Sports Academy honored soccer legend Pelé during the dedication of the country’s new national stadium in Libreville on Thursday, Feb. 9. Gabon’s new 40,000-seat Friendship Stadium in its capital city is co-hosting the Africa Cup of Nations, which are the continent’s soccer championships. As part of the tournament and dedication of the stadium, Gabon worked with the Academy to commission three of its Sport Artists of the Year to create pieces depicting Pelé. The unveiling of the artwork at the event featured Gabon President Ali Bongo, Pelé, Joe Szlavik, the Academy’s Board of Visitors chairman, and Academy Vice President Dr. T.J. Rosandich, who served as emcee and helped stage the ceremony. A bronze bust depicting a smiling Pelé, one of the greatest soccer players of all time, was sculpted by Harry Weber, the Academy’s 2011 Sport Artist of the Year from St. Louis. A multi-dimensional acrylic sculpture that features Pelé executing his famous bicycle kick was created by Sergey Eylanbekov, the 2004 Sport Artist of the Year from New York City. A painting depicting Pelé dribbling the soccer ball down field was done by painter Stephen Holland, the 1993 Sport Artist of the Year from Hollywood, Calif. This piece is signed by Pelé and will be displayed in the Pelé Room at the VIP entrance to the new stadium. President Bongo, who serves as the United Nation’s Security Council chairman, unveiled the works of art Feb. 9 as part of the stadium opening and hosting its first major sporting event. Dr. T.J. Rosandich is leading a four person team to study Gabon’s new soccer facility and its future uses. In addition, the Academy has partnered with Gabon to begin evaluating the country’s sports programs, developing a master plan to enhance the country’s efforts and establishing a sport education program to train its coaches and teachers. Gabon, which has a population of about 1.5 million, has participated in the Olympics since 1972 with its largest delegation being sent to the Atlanta Centennial Olympic Games in 1996. Gabon’s national soccer team lost in the quarterfinals of this year’s Africa Cup. Zambia won the championship Feb. 12 in a dramatic 8-7 shootout over Ivory Coast after finishing the game in a scoreless tie.